Zion Market Research has published a new report titled “Professional Services Automation Software Market By Solution (Analytics, Billing & Invoice Management, Contract Management, Project Accounting & Management, Timesheet & Expense Management, and Others), By Service (Consulting, Integration and Implementation, and Training & Support), By Deployment Type (On-Premises and Cloud), and By Vertical (Audit & Accountancy, Architecture, Engineering & Construction, Banking, Financial Services & Insurance (BFSI), Government, Healthcare & Life sciences, Information Technology (IT), Legal Services, Media & Entertainment, and Scientific Research & Development Services): Global Industry Perspective, Comprehensive Analysis, and Forecast, 2017—2024”. 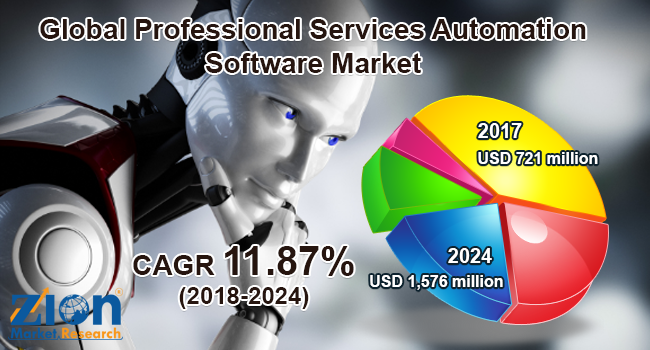 According to the report, the global professional services automation software market was valued USD 721 million in 2017 and is expected to reach around USD 1,576 million by 2024, at a CAGR approximately 11.87% from 2018 to 2024. Professional services automation software is designed to standardize business processes, deliver insights, reports, and control resources and projects. The key functions of professional services automation software include expense management, project management capabilities, resource allocation, invoice management, automated time and billing, etc. The global professional services automation is gaining momentum as several business sectors are seeking to improve their business processes by moving from on-premises to cloud-based services. The benefits of adopting professional services automation software are reduced spending and improved enterprise efficiency, which are expected to drive the professional service automation software market globally in the years ahead. Changing landscape of analytics, business intelligence, and big data along with the escalating need to improve operational efficiency are also anticipated to boost the professional service automation software market in the upcoming years. Moreover, the increasing competition and pressure on organizations to become more data-driven coupled with the rising demand for customer interaction to maintain customer satisfaction and delight are likely to further accelerate the professional services automation software market. However, futile data management and incomplete and incompatible data are certain challenges faced of this market. By solution, project accounting and management are anticipated to hold a significant market share in the future, due to data visualization and analytics, digital assistants, and machine learning. The data garnered from the traditional project accounting and management approach is also utilized for various other applications. By vertical, the audit and accountancy segment is projected to witness a high growth rate over the forecast time period. This vertical includes organizations that are majorly engaged in auditing, accounting, filing tax returns, designing accounting systems, developing budgets, payroll processing, etc. Finance management is a crucial part for successfully operating a business. Professional services automation solution helps audit and accountancy firms, agencies, auditors, and accountants to ensure consistency and quality of services delivered to customers. By region, North America and Europe are likely to lead the professional services automation software market globally over the estimated timeline, due to the growing adoption of cloud technology and advanced IT infrastructure facilities across both the regions. The Asia Pacific professional services automation software market is predicted to grow at the fastest rate from 2018 to 2024, owing to the emerging business destinations, such as India and China. Some prominent players of the professional services automation software market include Appirio, Inc., Autotask Corporation, ChangePoint Corporation, Clarizen, ConnectWise Inc., Compuware Corporation, Deltek, Inc., FinancialForce.com, Harmony PSA, Kimble Apps, Microsoft Corporation, NetSuite OpenAir, Oracle, Planview, Promys, Inc., Projector PSA, and Tenrox, among others.